Seventh Crusade (1271-1272) - The total number of Crusades varies depending on how they are counted. There were as many as nine if the Fifth and Sixth, and the Eighth and Ninth are counted as separate campaigns. But just as the Fifth and Sixth are often grouped together, so are the Eighth and Ninth, which could reduce the number to as few as seven. So once again, for the sake of brevity, this chart will count the last two as one. Therefore, the Seventh and last Crusade effectively ended the European presence in the Holy Land. In fact, it was primarily the Crusaders' last desperate effort to hold onto their lands in Outremer (Outremer is the term used to describe Crusader holdings in the Holy Land). The end began when the Mamluks were finally able to halt the Mongols' advance at the Battle of Ain Jalut in 1260. This allowed them to turn their attention toward the Crusader kingdoms. The general of that victory, Baibars, became sultan of the Mamluks. In 1268 he conquered the Principality of Antioch. After nearly three centuries of fighting, it appears as if the Europeans were finally suffering from Crusader fatigue. The call for another campaign in the Levant was largely met with apathy. The one exception was Prince Edward of England (also known as Edward Longshanks, who was famously depicted in the movie Braveheart). In 1271, he traveled to Acre, capital of the Kingdom of Jerusalem. Accompanying him was Charles of Anjou, brother of King Louis IX of France (who led the Sixth Crusade). As they arrived, Baibars was besieging Tripoli. Edward and Charles marched on Tripoli and managed to break the siege. In an interesting move, Edward tried to form an alliance with the Mongols. It was only partially successful. 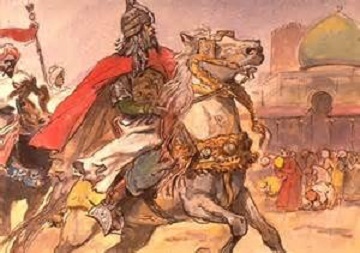 Abaqa Khan of Persia (great-grandson of Genghis) agreed to an alliance, but because of instability in other parts of his empire, was only able to send 10,000 horsemen. They briefly raided Syria, but were eventually driven off by one Baidars' armies and did not return. In the meantime, Baibars realized that as long as the Europeans (primarily Venice) controlled the sea, his land would remain vulnerable to attack. So he built a fleet of his own effectively cutting off Europe from the Holy Land by sea. Realizing his predicament, Edward negotiated a peace agreement with Baibars in May 1272. Another interesting event was the attempted assassination of Edward by Baibars about a month after the deal was reached. Edward killed the assassin, but was wounded. He remained in Acre until September in order to recuperate. He learned of the death of his father, Henry III, on his trip home and returned to England to become its next king. The last Crusader stronghold of Acre fell in 1291, and the Crusades were over.